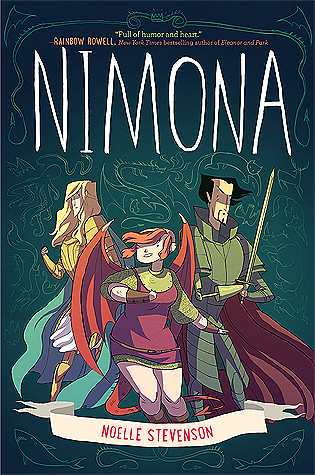 This book follows a girl named Nimona who is a shapeshifter. She wants to be a villain just like her idol, Ballister Blackheart. She finds him, and convinces him to let her be his sidekick and the story takes off from there. Nimona is different from a lot of people her age because she’s constantly dealing with issues from her childhood, and finding out who she wants to be. Ballister Blackheart holds a grudge that’s so deep to him that he blocks everything else out. They end up making the perfect team. I enjoyed this book. I didn’t give it higher than 3 stars just because the writing seemed very childish. I understand that Nimona is a kid, but it was very immature sounding. I liked the idea of the story, that the villain becomes someone he wants to be not what society has been telling him to be. I enjoyed that, and I also really liked the artwork. It was interesting to look at and easy to understand. The colors were beautiful, and I would recommend this book to a younger audience. There wasn’t much plot, so again, I find it a little hard to review, but I did enjoy it. I liked the little adventures that Nimona and Ballister went on. I liked that Nimona called Ballister, “Boss.” It was cute. They became close friends, and I thought that was an important element to the story. This hinted at Ballister being gay, and I was all for that. I really liked this because it wasn’t obnoxiously stating that he was gay; it was subtle and I don’t know if a lot of people would have caught that. I really loved the little story at the end with Ballister and Goldenloin. It was so cute. Aww. Overall, I think this is targeted towards middle grade readers, and I think if I would have been exposed to books like this when I was the right age it would have changed my reading experiences.